I used to have a personal time-tracking system based on Journal in Microsoft Outlook. Eventually I got it to work, but it was taking too much time and effort. About two years ago I abandoned it. But then over a year ago I switched from PC to Mac and things got much more interesting. Mac does not have Microsoft Outlook but Mac has many excellent time-tracking applications. I first tried iBiz but was not much impressed – it had too much focus on billing your time to different clients which was ver far from my purpose of time-tracking. Eventually I found an excellent program called OfficeTime which far exceeded my expectations. It made time tracking almost effortless and really fun. When you track time with OfficeTime you can configure it so that it registers when you are away from your computer for more than, say, 5 min and stops timing. When you come back the program asks you whether you want to subtract the minutes you have been absent from your project. One of the greatest features of OfficeTime is that it synchronizes with Mac Calendar, iCal. For example, if you have an appointment from 1 to 2 pm scheduled in your calendar, OfficeTime can automatically record this one hour as spent on a specific project (based on the particular calendar and keywords in the title of the iCal event). This really saves time in tracking big chunks of time (for me these are lectures, meetings and travel). OfficeTime can also work the other way around. For example, if you are timing your work on the project, OfficeTime can add it to a particular iCal calendar, thus making it easy for you to see how you spent your time in the last days or weeks. Suddenly, my iCal started to see meaningful and I know much better where the time goes! I am planning a separate entry on how to integrate OfficeTime and iCal effectively. Another OfficeTime feature is that it allows you to track not only projects but also “categories”. Essentially, you track your work in two dimensions: its focus (for example “teaching”, “research”, “administration”) and its nature (for example “travel”, “planning”, “meetings”, “writing”). This is extremely useful for reflecting upon and organizing your work as explained here. 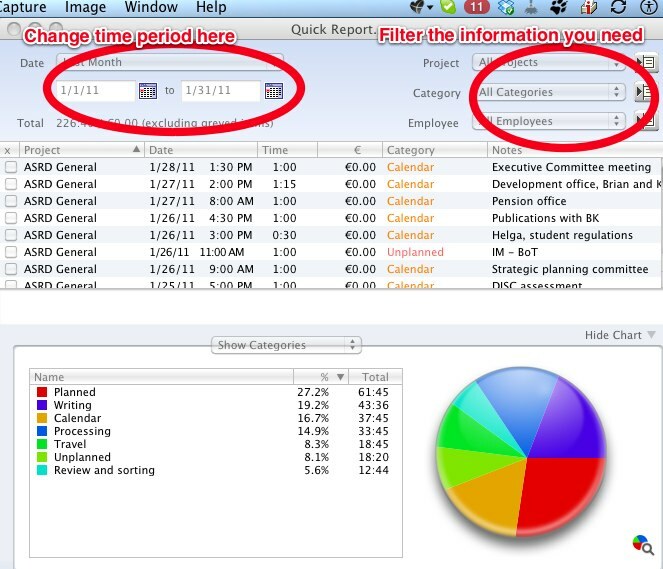 Naturally, OfficeTime (as other time-tracking utilities) does automatic summary, analysis and reporting of all your time. Thus I am spared from copying Outlook’s Journal data to Excel and analyzing them manually! With one keystroke (Cmd-K) you get a report like this (which can easily be regrouped into projects or categories or displayed for a different time period). So the timing is back! This entry was posted in Time and tagged OfficeTime. Bookmark the permalink. Hi Aleh! The way you decribe OfficeTime is ver convincing for me. Have you used any other time trackers like TimeCamp , Toggl, Harvest or Rescue Time? What do you think, which of them is the best? John, I have stopped tracking my time so closely, so I did not try any of those. Great article, thanks. If you ever consider switching back to Windows, I’d recommend that you take a look at TimeSheet Reporter, which allows you to track time via Outlook.